Organic vegetables, farmers’ markets, home-made jam and bread, balcony gardens and skyscraper farms – not to mention Farmville or that frightful Food Inc documentary … farming is “trending”, to use Twitter speak. Even trend forecaster Li Edelkoort, recognised by Time magazine as one of the top 25most influential people in fashion, said so at the Design Indaba Conference this year. 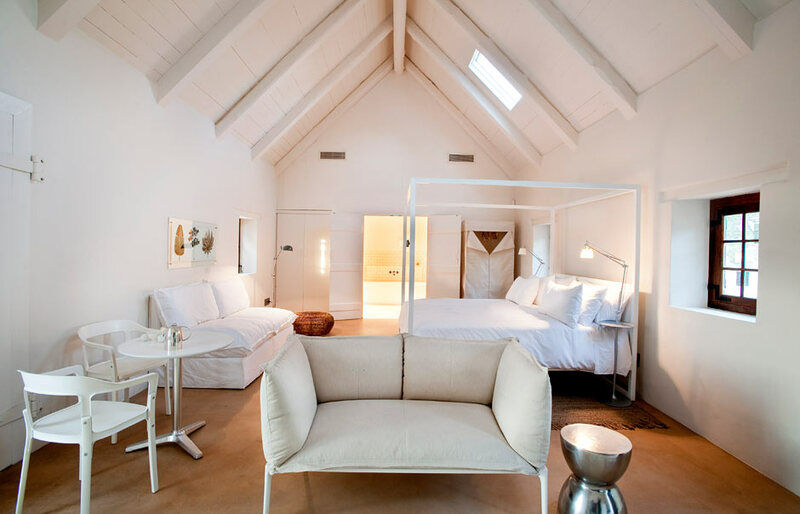 Locally, Karen Roos has exemplified the contemporary farm vision in her new boutique hotel venture, Babylonstoren outside Franschhoek. The wife of media mogul Koos Bekker, Roos is known for her one-time popular décor series Huis Huis on SABC2 and being editor of Elle Decoration for five years, a position she quit earlier this year to dedicate herself to the project, which she says is inspired by “impractical romanticism”. Dating back to 1690, the Babylonstoren estate is an A-grade heritage site. Bought three years ago, Roos and team spent the first while restoring the manor house, wine store and grain store to their original glory, adhering to the strict heritage guidelines associated with classic Cape Dutch architecture. “The buildings on the Babylonstoren werf are part of our heritage. Other people have nurtured them over 300 years and now we need to do a bit,” acknowledges Roos. Shaped in the traditional H floor plan of Cape Dutch architecture, all four of the wing rooms of the manor house have light entering from two sides. Guided by Cape Town architect Trevor Thorold, the restoration sought to maintain the original stone floors, Baltic pine floors, yellowwood ceilings and room fittings as far as possible, including the exterior bread-baking oven. Meanwhile, the interiors were guided by architect James Brummer from Joburg. Graceful antiques from the period lend the rooms authenticity. However, lightness and contrast is introduced with contemporary Italian sofas, original South African designs such as the Willowlamp, and other boldly modern pieces. Central to the Babylonstoren experience, however, is the formal 4ha vegetable and fruit garden. Roos commissioned French architect and landscaper Patrice Taravella of Prieure D’Orsan to help conceptualise the garden, taking initial inspiration from the original Cape Town Company Gardens, planted by the Dutch East India Company as a source of food in the 17th century. Further influences from regional farm gardens were also taken into account. Taravella is internationally recognised for his authentic recreations of medieval and other historic gardens. With 280 varieties of fruit and vegetables, absolutely everything in the garden is edible – even lawn has been substituted with thyme and oregano variants, and gravel with the pips of stonefruit. The selection of produce is based on the seasons, with something being in season at all times of the year. The gardens also include a chicken coop, beehive, fish ponds and ducks, which eat the snails. Separated from the garden by a citrus hedge, 12 guest cottages have been built on the foundations of previously condemned workers’ residences. A range of studio, one-bedroom and two-bedroom cottages were designed by Paarl architect Johan Malherbe. Some of the cottages have glass-enclosed kitchen and dining areas where guests can prepare produce from the garden while under the illusion of being outdoors. Inside, each cottage has been given individual attention by Roos. With furniture sourced from junk stores, demolition companies, antiquarians, young designers, design stores and a bit of internal recycling, each interior is different. A far cry from the 1993 Pauly Shore movie, Son In Law, in which the college party animal has to shovel excrement and dole out grain at daybreak, Baylonstoren is instead a “designed” farm-fantasy theme park without the dirty fingernails or ungodly hours.